Emoji: how do you get from U+1F355 to 🍕? You know that scene in The Rock where Nicolas Cage is super dreamy (like he is) and decides his life mission is to look for VX poison gas and save San Francisco (like he would)? That’s baaaasically me, if by “look for VX poison gas” you mean “nerd out on emoji”, and by “save San Francisco” you mean “and tell everyone about it”. I mean, you clicked on this link, what did you think was going to happen? 🍿 How did we get so lucky? An emoji is a coloured glyph. They appeared around 1999 in Japan, where each mobile carrier implemented their own variants, and people were sending them around in text messages. This was a bit of a mess, as you can imagine proprietary formats interacting with other proprietary formats to be, so in 2000 there was a proposal to standardize them. It wasn’t until 2009, though, that emoji got specced in Unicode 5.2 #blessed. 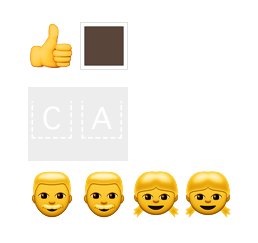 Spec trivia: each emoji has a design guideline and name, which is a description/suggestion of what the emoji should look like. This is why 💁,for example, often gets in trouble for being labelled as Information Desk Person, but is actually just a sassy lady: it’s the implementation of the emoji that doesn’t match its original description, not the other way around. If you take sassy lady away from me though, there will be words. My favourite description is Clockwise Rightwards and Leftwards Open Circle Arrows With Circled One Overlay (or 🔂 for short), which shows true dedication to typing. Emoji does not have a plural in Japanese, so stop trying to make emojis happen. Let’s talk about panda! 🐼 lives in the “astral” plane (it’s officially called a supplementary plane, but that’s boring), which means its code point has more than four digits, and is represented by two code units. This is called a surrogate pair. As we saw above, 🐼 is made up of two surrogates, U+D83D and U+DC3C. My favourite emoji (thank you for asking!) is the dancer from the Android set. Look at this blob. Look at all the shits it doesn’t give. It’s so happy. We should all be like this blob. 🙋 What about emoji modifiers? The flags are built around a weird (and annoying to implement) rule: the surrogate pairs (called regional indicators) spell out the country code (so 🇨🇦 is actually [C][A]). Skin colours are similar, but a little simpler: they’re made out a special emoji base + one of the 6 special colour modifiers. The couples/multi families are a sequence of characters, that together make one emoji. 👾 So what does Chrome do? Okay, cool! We figured out what code units we need for 🇨🇦, now, let’s figure out how to render them! First, Chrome uses a text shaper called Harfbuzz. Text shapers take Unicode code points and convert them to glyph indices (basically saying “you’re going to have to draw glyphs 23 and 74”) – and guess what we have! Unicode code points! The text shaper is the one that knows how to look at this stream of code units and surrogate pairs and figure out which are standalone, which are weirdo flags, and which are modifiers. Once it’s done with it, it comes up with the glyph and the position where to draw it. If you think about a couple, 👩‍❤️‍👩, all surrogate pairs need to be drawn on top of each other, so that the spacing around the final glyph adds up. This glyph and its size/position eventually goes to Skia, Chrome’s graphics engine. It is the one that paints the right thing on the screen (here is that code). Fonts, boy, them’s a pickle. There’s basically one font per platform that actually knows how to draw emoji (unless you went out of your way to install extra ones). All the other fonts just rent the emoji from it. These fonts are AppleColorEmoji (OS X), Segoe UI Symbol/Emoji (Windows), NotoColorEmoji (Android) and I don’t know what Linux does, but it’s probably black and white and who cares, I hear you can run bash on Windows now. I’m going to keep talking about the Apple font, because that’s the code path I worked on in Chrome, but Windows works very similarly. Chrome (specifically Blink) will first look up the glyph corresponding to 😻 in the Comic Sans font. It won’t find it, so it will first try the web fallback font, the default platform sans-serif (I think on OS X this is Helvetica, and it’s probably Arial on Windows). That also doesn’t have the glyph (remember, only one font knows how to draw cats with heart eyes), so Chrome knows to fallback to AppleColorEmoji by looking at the glyph: it’s 32 bits and it has an emoji presentation, so it must be an emoji. Here’s the code where that happens (the real work is done here and here. This entire last file is pretty glorious and useful if you ever need to know if a thing is an emoji or not). Cool, so now Chrome knows to ask AppleColorEmoji for the cat, takes that glyph, passes it to Skia, and paints it in the right position, and everything is fine. Cool cool cool. Remember though how in Atom, you see instead? What’s up with that? Atom is built on Chromium soooo it should work, right? Well as we know, software. This fallback logic I just mentioned was a bit broken pre Chrome 50 for flags and modifiers and complicated emoji like that. So Chrome got as far as figuring out that there were two different glyphs, “thumbs up” and “skin colour”, but not how to fallback to the correct font and draw the compound “black thumbs up” glyph. So that’s why you got them separately. That’s been fixed now! Yay! Congratulations! Now you too can be Nicolas Cage and shout at people about emoji trivia! Wasn’t this fun?